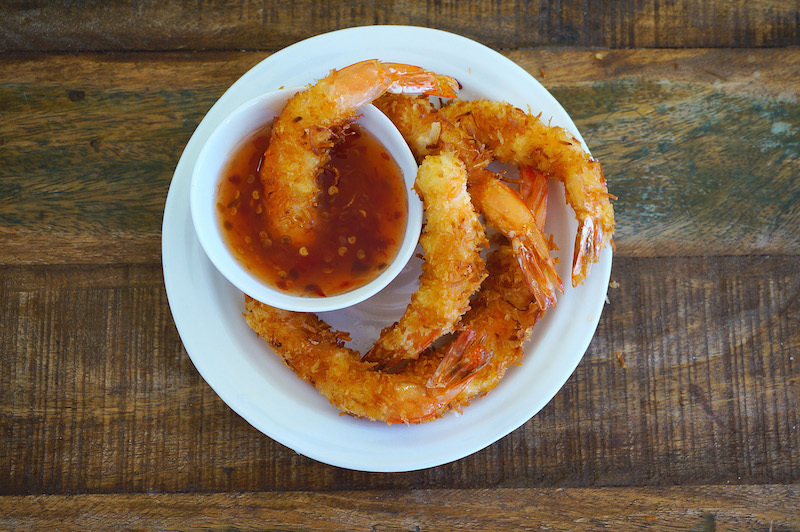 This is a tasty fried coconut shrimp, served as an appetizer with some Thai sweet chili sauce. The shrimp is coated with coconut and bread crumbs, and crisp up nicely on the outside, but remained soft inside. Combine breadcrumbs and shredded coconut. Lightly coat the shrimps with all-purpose flour, then dip the shrimp into the beaten egg white, and then coat it with coconut and breadcrumb mixture. Lay the shrimps in a plate. Continue the process with the remainder ingredients. Heat the oil over medium to high heat. Deep-fry all the shrimps until golden brown in color, about 1 1/2 to 2 minutes. Remove and drain well on a wire strainer or paper towel. Serve with Thai sweet chilli sauce.